If you like freshly baked bread, this one is a must. 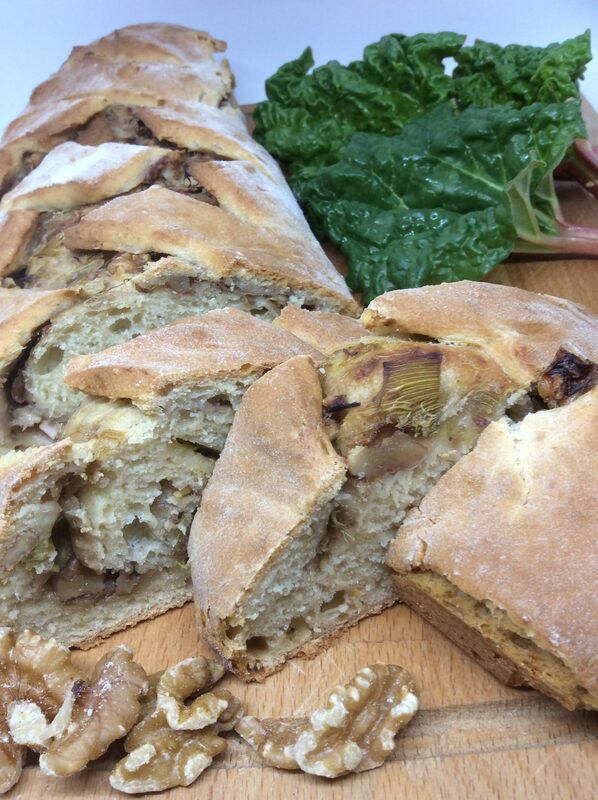 Yeast Bread Dough layered with sharp Rhubarb and ginger coated crunchy walnuts. Delicious!! Heat the milk in a jug to a tepid temperature. Add the yeast and mix well. Add the flour, salt, sugar and butter to a mixing bowl and blend the ingredients. Add the yeasted milk. When the mixture becomes a dough, leave in the mixing bowl, cover with a towel and stand in a warm area to allow the dough to prove. This process will take 30 minutes. Trim, clean and chop your rhubarb into 2cm pieces, place in a saucepan together with the demerara sugar and 2 tbsps of water and gently simmer until the rhubarb is soft. Drain the rhubarb using a sieve and allow to cool. Mix the walnuts and ginger together and put to one side. Remove your dough from the mixing bowl and knead on a floured surface for 2 minutes. Roll the dough out into a rectangle approximately 30cm x 40cm, with the shortest side nearest to you. 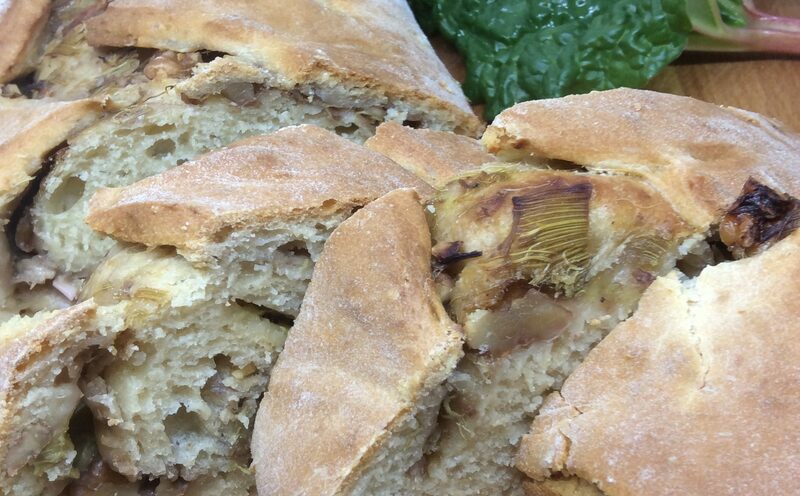 Spread the drained rhubarb over the dough leaving a 2cm border uncoated. Now sprinkle over the nuts and ginger. Start rolling the dough away from you until it resembles a swiss roll. Gently place the loaf onto a greased baking tray. Make 4 diagonal cuts into the dough to the right, about 1cm deep, and repeat with with 4 diagonal cuts to the left at the same depth. Place the loaf on the middle shelf of the oven for 15 minutes. Then turn the temperature down to 140ºC for a further 45 minutes. Remove from the oven and allow to cool on a wire tray for 15 minutes before serving.